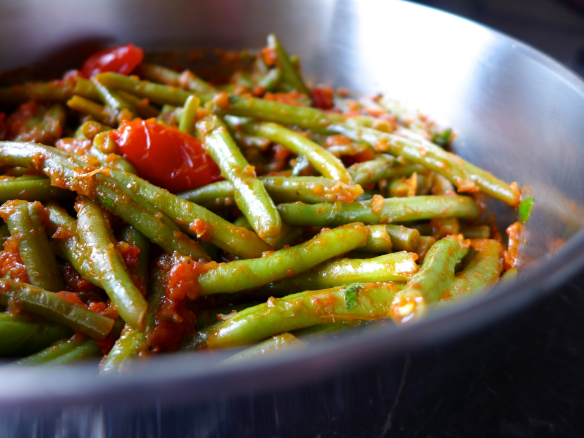 A simple mix of green beans, onion, and tomatoes make a healthy side dish. With 6g of fat and 3g of carbs, it's low carb and keto diet friendly! Sprinkle with cheese to make it special. In a large skillet cook onion and garlic in hot oil about 5 minutes or until tender. Add undrained tomatoes, olives, and oregano. Bring to boiling; reduce heat. Boil gently, uncovered, for 10 minutes. Add beans. Return to boiling. 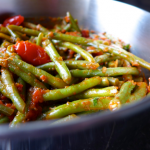 Boil gently, uncovered, about 8 minutes or until desired consistency and beans are tender. Transfer to a serving bowl; sprinkle with cheese. If desired, serve with a slotted spoon. Low Carb Onion Rings | Delish!